The hip flask shown at left is in russet leather with a basket stamp. The traditional stainless steel hip flask holds 8 oz or 12 oz. of your favorite beverage. 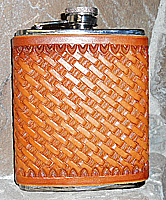 Sharp's Flasks are also available in chestnut, brown, and black leather, and may be personalized. The flask at left is shown in brown leather with a basket stamp, personalized with a fancy font. 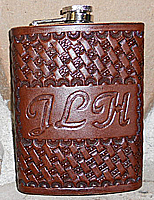 Leather covered western hand carved floral flask shown at left in chestnut USA leather with added initial personalization. Various font styles available. The custom flask shown at left is in russet leather with a basket stamp. The traditional stainless steel hip flask holds 8 oz or 12 oz. of your favorite beverage. Sharp's Custom Flasks are also available in chestnut, brown, and black leather, and may be personalized with initials, name, ranch brand, or company logo. 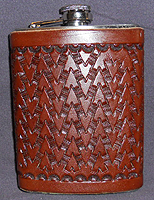 Flask with western ranch brand shown in russet USA leather. 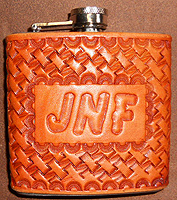 Custom leather covered flask holds 8 oz. or 12 oz. Flask itself is stainless steel. Arrows basket stamp shown in brown leather. Can be personalized, available in all 4 of our leather colors. 8 oz. and 12 oz. 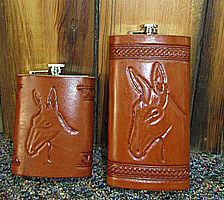 mule head flasks shown in chestnut leather. Available in all 4 of our leather colors. Can be personalized. Sharp's custom leather flasks are perfect for the hunter, outdoor enthusiast, or just a ride along hip flask. Flask itself is stainless steel covered in high quality genuine USA leather on the outside of the flask. We can stamp or tool a unique design in your leather covered flask or add a name initials or other personalization to your flask. Flasks make great affordable gifts for both men and women for any and all occassions. 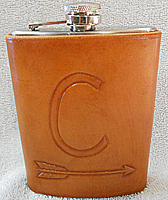 Personalized flasks for the groomsmen in your wedding party are great keepsakes! Call us for more information on exotic leather skins for your hip flask such as shark, pearlized leather or metallic colored leathers. If you're looking for a traditional canteen, sports bottle, or thermos bottle, we have those, too! Please click the Home link below.